The Dangerous Practice of illegally refilling exchange gas bottles. - GAS IT Leisure Gas Bottles, Gas Cylincers and Gas Tanks - Catering, Motorhome, Campervan, Caravan, Farrier and Road Repair Refillable Gas Solutions. The dangerous practice of refilling Exchange Gas bottles. Is the unsafe and illegal practice of refilling an everyday exchange only Gas bottle worth being taken to court or even worse injuring or killing yourself and those around you, especially when there is a safe and legal self-refillable product available? To sum it up, refilling exchange gas bottles ( Calor, Flogas, Countrywide, BP and any exchange only gas bottle ) which are not designed to be refilled by the general public at LPG fuel stations and forecourts is like driving your car along a motorway without touching the steering wheel - It’s that dangerous for you and people around you and at some point the worse is going to happen. Buying a fill system off eBay or various web shops that lets you fill a Gas bottle from Calor gas, Flogas and other exchange bottle companies with pump Autogas, that it was never designed to do so is not only illegal and a prosecution able practice but it’s dangerous to you and those around you so why risk everything to save a few £'s self-refilling an exchange bottle illegally when there are legal and safe refillable bottles like the GAS IT or other brands that are fully covered by UK and EU regulations and can be refilled anywhere legally and most importantly safely. It’s a no brainer! 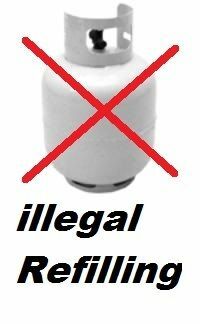 We've all seen the filling adaptors on eBay and some web shops that allow you to refill gas bottles that were never designed to be end user refilled, as they were only to be returned and exchange for a new full one, but did you know it’s actually an illegal practice that people are being prosecuted for here in the UK and it’s not just by Calor Gas. You are also contravening UK Health and Safety Regulations, Weights and Measures Regulations and Consumer Safety legislation the list goes on. These Regulations impose important legal duties on the site operator to ensure the safety of both their employees and members of the public and even the site owners can be prosecuted and have trading licenses removed. The HSE (Health and Safety Executive) has even stated in writing that “PLAs should consider issuing a prohibition notice if their inspectors discover a site which allows members of the public to refill gas cylinders”. Which means the forecourts and gas stations are risking prosecution and not only you if you were caught or if an accident was to happen. You also risk having your vehicle or Caravan insurance invalidated if you are found to have self-refilled a bottle illegally and then something goes wrong - is the practice worth it? People assume wrongly that the reason why these companies says don't do it is simply because the Gas companies are losing money when you self-refill one of their bottles and that’s its sole reason. Well, that’s just not true. 100% of the reason is that it’s a very dangerous practice in many ways and every time you do it you not only risk yourselves but everyone around you during the filling, use and storage of that illegally refilled bottle, but the bottom line is you have to be aware that whilst these self-refilling adaptors are readily available you need to know the refilling practice is illegal and silly especially with the legal and safe alternative approved refillable bottles from GAS IT. All our GAS IT Self refillable gas bottles and tanks are fitted with the latest over fill protection shut off valves have been designed for self-refilling and have the right approval paperwork.